As usual, the scientists have no clue what they are talking about, and the sole purpose of their research is to keep their funding from drying up. Its embarrassing to think theyre so stupid..
and enraging to think that they reckon WE are gullible enough to fall for it.! and some sheeple here DO believe this crap sadly. normally the converted goracle crew. Geoffrey Lean and his moron cli mates at Melbourne Uni are going into meltdown because the carbon tax repeal keeps being sent to the Senate. Come July with the new Senate and it will either pass or there will be a double dissolution and the Labor Party will be smashed. I would appreciate any links for conservative Australian news sources or political movements. He, and David Karoly were on ABC Lateline earlier babbling about universities investments “climate risk”. Monash Uni and top scientists are caught out insider trading. Unfortunately, Steven, fraud has been the norm for government sponsored science since 1945 – except perhaps for a very brief period when JFK was president and trying to recapture our national independence. That is a bitter pill to swallow, if true, but it explains too many events to ignore. I am so tired of unethical scientists worldwide! It is not limited to Australia. This is a scam of global proportions, and universal suffering. there is too much potential profits for Wall Street and the crooked politicians to ever let the AGW scam go down. We neeed Russia to hack some more E-mails. I meant to send this to you but didn’t have time. I read it in the Melbourne paper and couldn’t believe what i read. They are now just flat out lying. 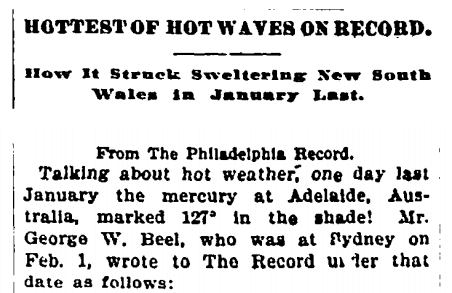 Still cannot beat the heat of 1908 or 1960, those records may never be broken. 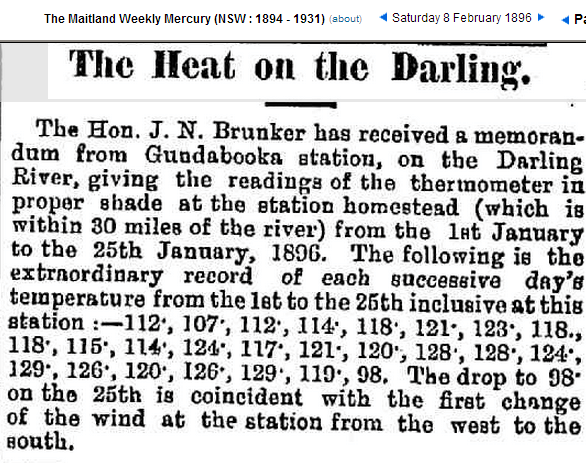 Meanwhile back at the BOM they are surreptitiously removing old high temperature records from the database on the grounds they were not measured to modern standards – the most common excuse being the thermometer was directly in the sun. If this is a reasonable claim all records before the early 50’s should be expunged. And remember folks, cold winters are only weather, according to “top climate scientists”. 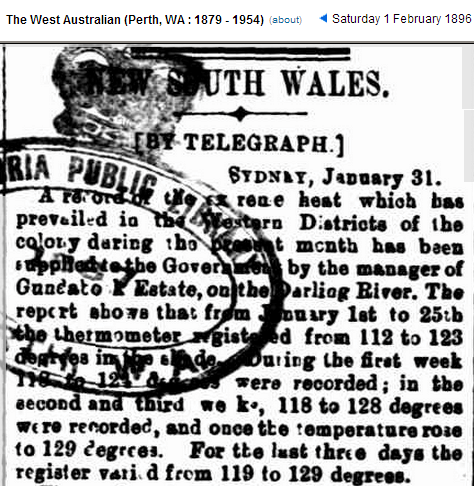 Searching the old news papers in trove.nla.gov.au for my home town in Australia, Mildura, I came across an article from 1906 about two consecutive days of 123 and 124°F. These are about 51°C. The official highest is 46.9°C. Other articles show that the older temperatures were taken in the middle of a large boulevard (30 m wide nature strip between two unpaved roads) that was lined with trees, using equipment in a Stevenson Screen by the post master. There was extensive irrigated farming around the town at the time, as there is now. The official record comes from a station at the airport. 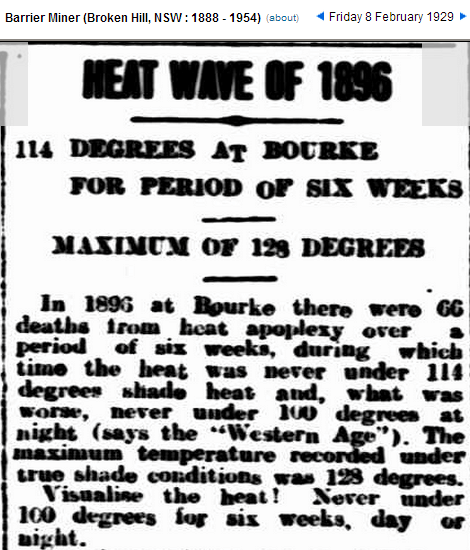 It should be shattered soon but hopefully after the scare is over as Adelaide extreme temperatures show a bit of a lull in between 1950-70 when these new stations at the airports started. STEVE GODDARD contends with Australian Climate scientists. He is so ‘gobsmacked’ he claims they are fraudulent..! !